Raquel Urtasun, chief scientist at Uber Advanced Technologies Group: "Self-driving cars are going to be in our lives. The question of when is not clear yet." NEW YORK — Uber Technologies Inc. expects it will be a long time before one of its biggest investments, self-driving vehicles, is ready for wide-scale deployment, a senior scientist said Monday, as the ride-hailing company gears up to go public. 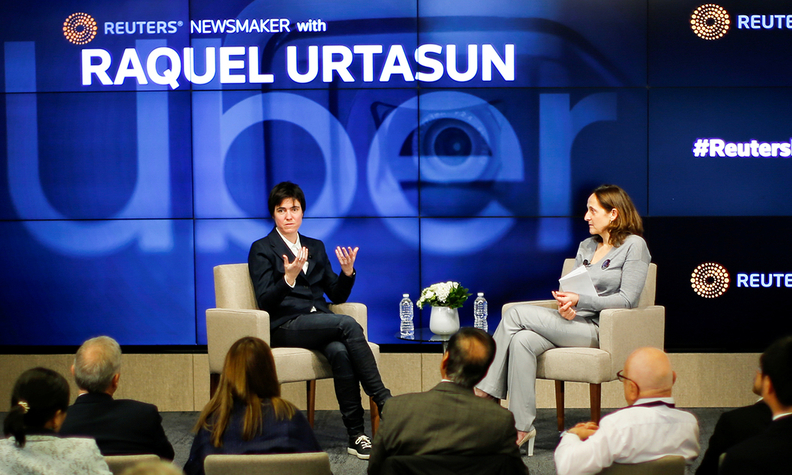 Raquel Urtasun, chief scientist at Uber Advanced Technologies Group and head of the group's unit in Toronto, spoke about the challenges for self-driving development at a Reuters Newsmaker event in New York. The more cautious tone marks a change from three years ago, when Uber embraced aggressive tactics to turbocharge its autonomous vehicle development in a bid to get more robotic taxis on the street driving more miles. The company had been seen as an industry leader in the technology until one of its autonomous vehicles killed a pedestrian in Tempe, Ariz., in March last year. "What is clear is that in a 10-year time frame there will be a mix of both" self-driving and human-controlled cars, she said. The business of building self-driving cars is extraordinarily expensive and the time frame to payoff is increasingly uncertain. However, some consider Uber's ability to successfully navigate the transition to autonomous vehicles as crucial to the company's long-term financial prospects. Uber opened its Advanced Technologies Group in Toronto in 2017 and named Urtasun, who is also an associate professor at the University of Toronto, as head of the Toronto organization. Uber said last year it would invest more than $150 million in Toronto to grow its self-driving car operations, open an engineering hub and expand its work in artificial intelligence. Uber has recently taken a more collaborative approach, inviting General Motors' self-driving car unit, Cruise, and Waymo to put their cars on Uber's ride-hailing network. Urtasun said Monday that Uber encouraged every self-driving company to add their cars to the Uber network. "We've been very, very open that we would like every other company to be in our [autonomous vehicle] network," said Urtasun. A group of investors led by SoftBank Group Corp. and Toyota Motor Corp. are in talks to invest $1 billion or more into Uber's self-driving vehicle unit, Reuters reported last month.